Democrat (Term Expires: 2022) serving Bucks (part) and Montgomery (part) Counties. Senator Maria Collett represents the Twelfth Senatorial District across parts of Bucks and Montgomery Counties, which encompasses more than 247,410 people in Ambler, Bryn Athyn, Hatboro, Hatfield, North Wales, Souderton and Telford Boroughs and Franconia, Hatfield, Horsham, Lower Moreland, Lower Gwynedd, Montgomery, Upper Gwynedd, Upper Moreland, Upper Southampton, Warminster and Warrington Townships. Maria is a lifelong advocate for people in need. 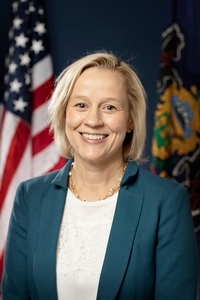 She began her career as an attorney representing the interests of children victimized by abuse and neglect as a Deputy Attorney General in Camden County, New Jersey. She then transitioned to a career in nursing, where she worked at the bedside as a Level I trauma nurse, in pediatric home health and in long term care working with aging adults. Most recently, Maria worked as a nurse educator, helping other nurses understand how to administer Medicaid programs. From a young age, the values of hard work, integrity and humility were instilled in Maria by her Greek immigrant father who came to the U.S. to earn a Ph.D. in Economics and by her mother, who rose from a disadvantaged childhood to became the first member of her family to graduate from college. Maria has a BA in English Literature from the University of Maryland at College Park, a JD from Rutgers University School of Law and a BSN from Drexel University. As a senator, Maria is committed to making sure Pennsylvanians have clean, safe drinking water and access to quality, affordable healthcare. Maria is also passionate about making sure we have fair elections, common sense gun safety legislation, and an economy that works for all Pennsylvanians. Maria and her husband Len, an attorney, reside in Lower Gwynedd Township with their 6-year-old son August and Maria’s 83-year-old father Emmanuel.